Backstreets #1 - Reprint of 1980 debut issue. 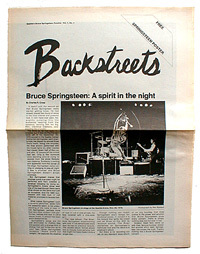 Charles R. Cross' article, "Bruce Springsteen: A Spirit in the Night," covering the December 20, 1978 concert in the Seattle Center Arena; centerfold poster of photo by Rex Rystedt; collector Ken Deranieau; six hottest collectibles; thirty bootleg albums. Four pages, black-and-white newspaper.